There are some books about religion which you will never read: the cover says it all, and it looks very impressive on the bookshelf. And there are others for which the dust jacket is a beckoning finger; a divine seduction compelling you to turn it over and feed your soul on the essence of its wisdom. And you begin at the beginning, for sageness is a cumulative exposition. Well, up to a point. For there are those believers for whom violence is a divine exhortation; and those images of God which feed on the lives of apostates, non-believers and heretics like a demon drinks the blood of martyrs and burns babies in the fires of Gehenna. The God who weeps and says “Not in my Name” is the God of true mercy, compassion, love and justice. Yet there are apprehensions of divine mercy for which killing is an act of compassion, love and justice. Is it not better to pluck out an eye or chop off a hand than burn for eternity in hell? The Rabbi is concerned with judicious scriptural exegesis; doctrinal relevance; the Sitz im Leben of the old paths and ancient precepts. Violence subverts compassion, but religion is not the cause of violence: that is the heart of man, which tends toward lust, pride, greed and power. When human debasement and the sins of the flesh are clothed in aspects of divinity, the solution can only be theological, for to wage war against those for whom violence is righteous is to sanctify their cruelty, barbarity and evil. Hardly a week, maybe hardly a day goes by without some terrible act of violence somewhere in the world. and so much of it is being done by religious people, seemingly in the name of God, and one of the reasons I wrote this book is to try and work out how can you actually do that? What makes people kill in the name of the God of life, or wage war in the name of the God of peace? What is it that connects religion with violence? Or between violence and monotheism? Or between violence and the Abrahamic monotheism – Judaism, Christianity and Islam? To answer it I had to delve deep into the history of religion and religious conflict, as well as evolutionary biology, game theory, psychology and sociology. But I’ve tried not to keep it there: I’ve also tried to think our way through to a better future; to some new religious ideas for the 21st century that might pull us back from the abyss. Can we deliver a message as powerful as religious extremism, that leads away from violence and toward respect between the faiths, whether we’re Jews, Christians, Muslims or just secular humanists concerned about the future? I hope that people who are just interested in the politics of the 21st century, who are fascinated by this growing phenomenon of religious extremism, and who are asking, basically, is there anything we can do about it, I think they will find the book interesting. And whether they agree or not, I think they’ll find it a challenging read. 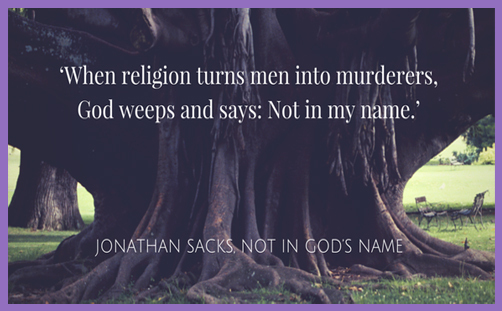 Not in God’s Name is essentially a plea for the non-violent love of enemies; to turn the other cheek, if you will. The covenant community of discipleship is not restricted to a single doctrine of God: it is the whole human family of faith. Don’t dismiss this wisdom as multifaith universalism. When Jesus said, “Blessed are the peacemakers”, He decreed that they shall be called the children of God. All of them. The Messiah subverted all expectations by refusing to wage war against Israel’s enemies: He never exerted force to gain social status or exert political power: at every turn He renounced violence as a strategy for promoting God’s kingdom. If you want to follow Him, you must become a servant, and be prepared to suffer. If you call down armies of angels to smite your enemies, you are no child of God. To be reconciled to Him, you must work for peace and reconciliation with your fellow man – whatever his corrupted apprehension of godhead, and however perverted his perception of the shadows of sanctity.